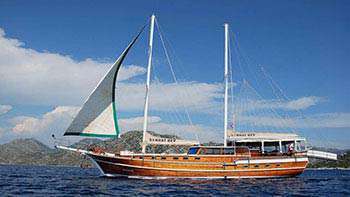 Marmaris - Datca - Marmaris with A/C Boats . DAY 2: ARAP ISLAND – BOZUKKALE . DAY 4: AKTUR – BENCIK . DAY 5: ORHANIYE – SELIMIYE – KOCA ISLAND . DAY 6: DIRSEKBUKU – BOZBURUN . DAY 7: KADIRGA or KUMLUBUK– CENNET ISLAND - MARMARIS . 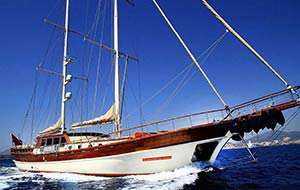 Boarding starts by 15.30 at Marmaris Marina. You will have time for visiting the old town and bazaar of Marmaris with its small streets and hundreds of shops, bars and restaurants. The castle of Marmaris lies on the old town hill and offers a beautiful view across the harbor. 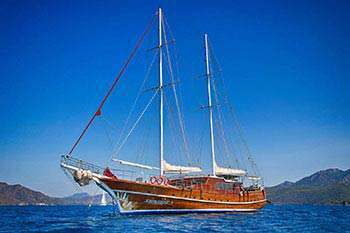 Dinner and overnight stay will be in Marmaris. After breakfast you will be informed about the cruise itinerary and boat. 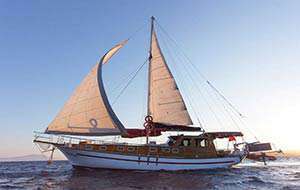 We set sail to Arap Island where the lunch will be served, then cruise to Bozukkale, known as Loryma in the ancient times. Bozukkale means 'Crooked Castle' and this name is given to the castle as its one side is missing. Dinner and overnight stay will be at Bozukkale. 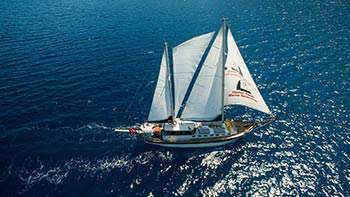 We will cruise to Aktur for a swimming stop then set sail to Bencik which has a narrow entrance but a unique view. Bencik is located at the narrowest part of the Datca Peninsula that divides Hisaronu Gulf from the Gokova Gulf. You should take a short walk up to the top of the hill in Bencik, you can have at the same time the fantastic views of these two gulfs. In 550’s B.C. the Knidos people wanted to dig a tunnel in Bencik, the narrowest land piece of the peninsula as defence line against the Persians. That way they tried to get Datca part as an island to make a stronger defence. However, in the end they could not manage and the city was conquered by the Persians. 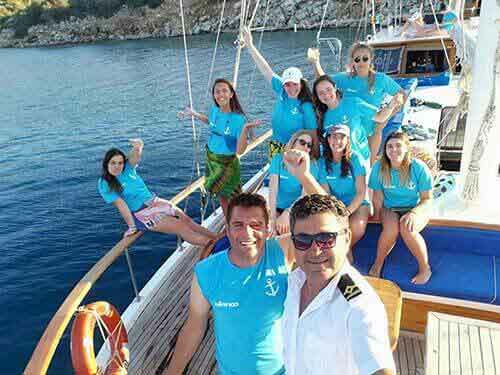 We will cruise into the Gulf of Hisaronu and anchor in Orhaniye where you can see the natural tidal formation called Kiz Kumu (Maiden’s Beach) and the wrecks of an antique castle located on a tiny island in the bay. Here, you may join an optional jeep safari which brings you to the colourful little villages in the mountains and to the water fall of Turgut Village. 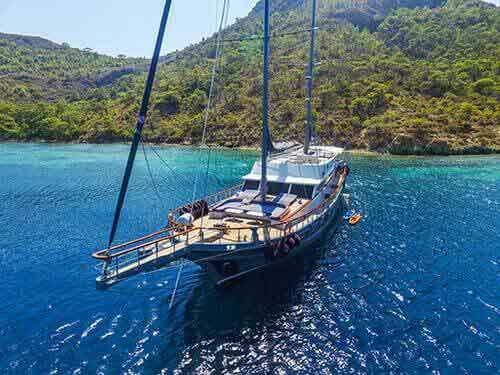 We will cruise towards Selimiye and anchor around Koca Island for the overnight stay. We anchor in Dirsekbuku bay for a swimming stop where blue and green meet in perfect harmony. Then we will go to Bozburun which is a small fishing town. 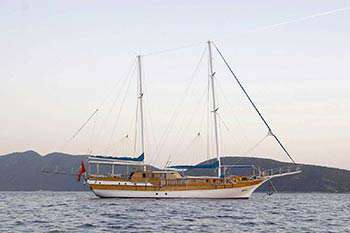 Overnight will take place in a nice bay around Bozburun. 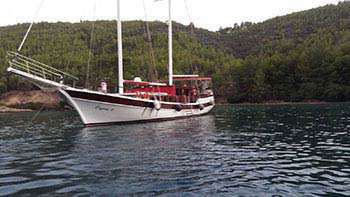 After breakfast departure for Kadirga or Kumlubuk bay which lies within the sight of Marmaris but is cut off from it by a forbidding set of Limestone Mountains. You will have lunch in a nice bay of Cennet Island. 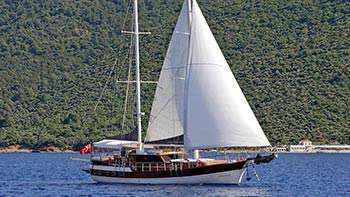 Overnight stay will be at Marmaris Harbor. Disembarkation by 10:30 after breakfast. *IMPORTANT NOTE: The A/C can be in use up to 8 hours daily, the use of the A/C in harbours is strictly forbidden. 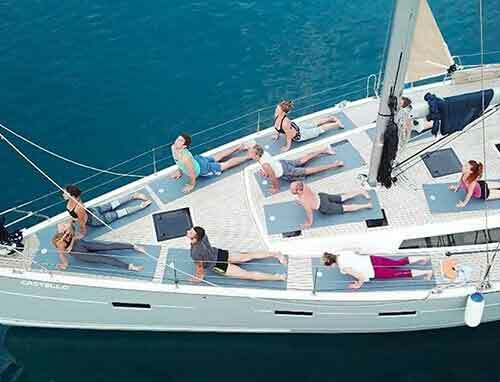 Depending on sea and weather conditions, Barbaros Yachting reserves the right to make necessary changes to the tour itinerary to ensure the safety and comfort of our guests. DETAILS OF THE PRICES FOR ALL ITINERARIES * No Hidden Charges!! All included except beverages !!! 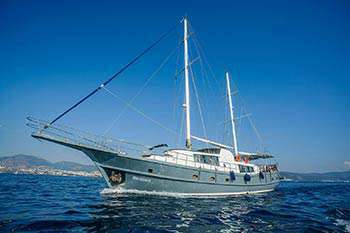 •	Full Board accommodation: Breakfast, lunch, afternoon tea / coffee & cookies, dinner. •	A 0,5 lt bottled water per person is included only during the meals. 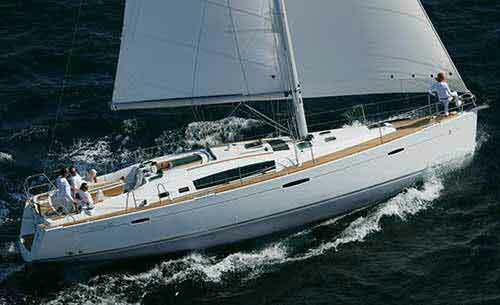 •	All charter & berth taxes, Harbour & Port procedures. •	Transit log & related formalities for the shipping agents. •	Diesel & Gasoline expenses. •	Clean bed linen and bath towels on arrival (Beach towels are not provided). 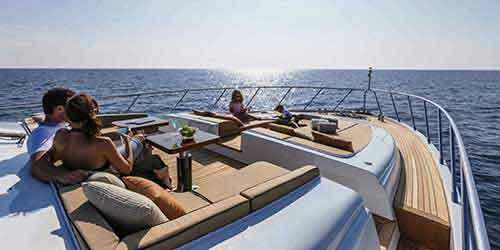 •	Yacht insurance (We advise you to take out your own individual travel insurance). •	Alcoholic & non-alcoholic beverages including bottled water. These can be purchased from the bar on board. •	Optional land tours and entrance fees to historical places and museums. 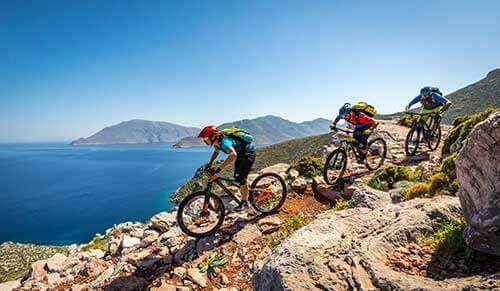 •	Individual port taxes on arrival and departure in Turkey & also Greece. 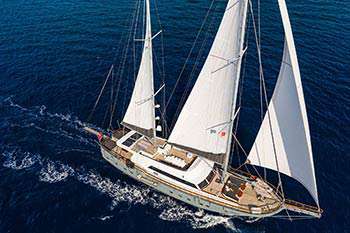 *Please note that; depending on sea and weather conditions, Barbaros Yachting reserves the right to make necessary changes to the tour itinerary to ensure the safety and comfort of our guests.